Meet your neighbor and Illini West Senior Caroline Eilene Hartweg. Caroline, the daughter of John and Linda Hartweg, was born on November 9, 1995 in Keokuk, Iowa but has lived outside of Carthage on a farm. John works in maintenance for the Carthage Elementary school and also drives a bus. Linda is the band and chorus director at Illini West. Caroline has one brother, Carl E. Hartweg, 22. Carl is attending Augustana College to pursue a degree in specialized nursing. She is the granddaughter of Carl A. Hartweg and the late Marilyn Johnson Hartweg of rural Hamilton and Ernst and Priscilla Lesch of Papineau. Both of her grandfathers were farmers. Caroline spends a lot of time on the farm. She has a lot of cows, poultry, sheep and horses. Her hobbies include riding her horse, playing piano and trumpet, showing livestock at summer fairs, and taking care of her animals. She was selected to go to Hugh O' Brian Youth Leadership Academy, WIEC Youth to Springfield, and Girl's State. She is in National Honor Society and is the Student Council Secretary, and participates in FFA, 4-H, Key club, International club, Drama club, and the school choir and band. Caroline loves taking trips with the band. Her favorite trip was going to Florida the summer between her freshman and sophomore years. Caroline was the Charger of the Month in September and attended the West Central Conference Band festival. She has participated in the ICTM Math Competition since her freshman year and placed 2nd individually freshman year and 5th as a team sophomore year at Regionals. She is on the high honor roll with a 4.0 grade point average. She is also an active member of Trinity Lutheran Church, where she is the youth representative on the church board, participates in the choir and bell choir, and acolyte. 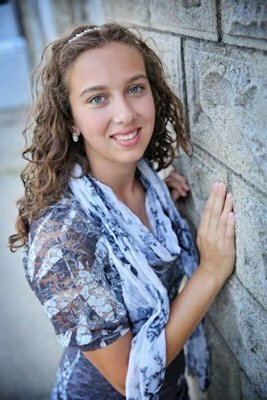 After graduating in May of 2014, Caroline plans to attend college at Augustana in Rock Island and pursue a degree in Pre-Veterinary Sciences.